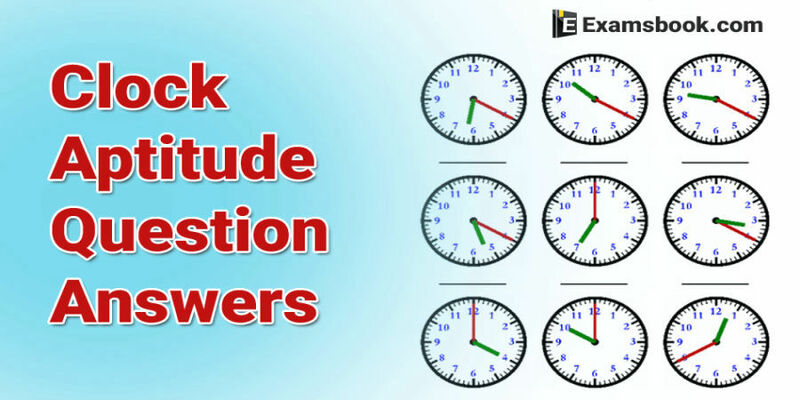 Clock aptitude questions asked in many competitive exams and clock problems are also important for SSC and Bank exams. Try to solve clock questions and answers for better results in upcoming competitive exams. Here I am sharing 26 important clock questions with answers for preparation of SSC and Bank exams. Let's find some important clock aptitude questions to practice. You should read the basics of clock related problems with solutions if you want to save your time in the competitive exam and to know how to use clock problem formulas in these type of questions. 1. How many times in a day, are the hands of a clock in straight line but opposite in direction? 2. At what time, in minutes, between 3 o’clock and 4 o’clock, both the needles will coincide each other? 3. At what time between 7 and 8 o’clock will the hands of a clock be in the same straight line but, not together? 4. At what time between 5.30 and 6 will the hands of a clock be at right angles? 6. An accurate clock shows 8 o’clock in the morning. Through how many degrees will the hour hand rotate when the clock shows 2 o’clock in the afternoon? 8. At what angle the hands of a clock are inclined at 15 minutes past 5? Ask me in the comment section, if you face any problem while solving clock aptitude questions. Visit next page for more clock problems.